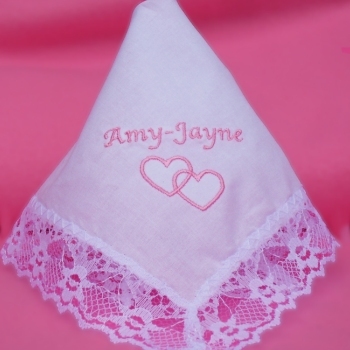 Romantic entwined love hearts embroidered onto a ladies pretty white lace trim cotton handkerchief. Romantic entwined love hearts embroidered onto a ladies pretty white lace trim cotton handkerchief. Have a name or intials personalised as well for an extra special gift. Choose from a single hanky or a gift set of 3 lace trim handkerchiefs. Choose from a single hanky or a gift set of 3 lace trim handkerchiefs. Select a thread colour for the text and the lettering font style you want. Optional gift presentation is extra, you can select from the drop down menu to add an organza gift bag or a gift box.